“It is not the destination so much as the journey, they say.” Well, sometimes, the journey could be through a boring city or a scorching desert when there is not anything very interesting to look at. So when there is literally nothing else to do but sit down and wait for the hours to tick by, you will inevitably be craving for some entertainment. And what if you have a couple of kids in the back with the same patience as a hungry shrew? Life behind the wheel could not get more interesting. It is precisely this gap in the market that gets filled in by a portable DVD player, like a DVD player, only portable. So now you do not have to wait until you reach your destination to put your legs up and binge watch your favorite movies and TV shows. You can enjoy them on the way. You just need to know not to buy one that is plagued with problems or else, your journey is bound to be even more miserable than normal. So if you have decided that you want to get yourself a portable DVD player at a decent price to keep you entertained during your long drives, you have come to the right place. Below, we have a compiled a list of what we think are the top 10 portable DVD players currently on sale and a buying guide by which you can make up your own mind about which one you would buy for yourself. Our selections have been based purely on facts, research, and simple numbers so we are betting that any one of them has the potential to meet your expectations and then some. But first, let us take a brief look at what you should be looking for. 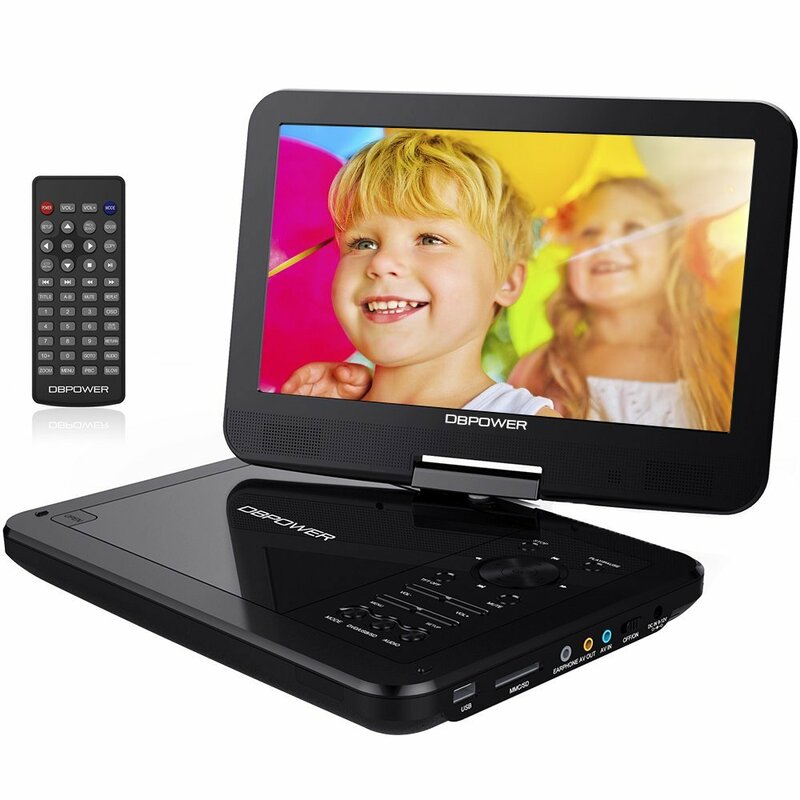 Finding the best portable DVD player for you is not easy given how many different models that in the market right now. But if you know what to look for, you should be able to eliminate a considerable number of these and finally end up with your best choice. Whichever that may be is largely subject to your individual preference as a buyer. However, there are some mandatory features that all buyers will want to see on their devices. Let us have a brief look at them right now. Portability: Of course, if it is advertised as portable, then it better be portable. Portability in a DVD player depends on size, weight, dimensions, and the number of components that go with it. Screen size: Ideally, you want as a big a screen as you can get as long as it which makes it easier to focus on displayed images particularly in a moving vehicle. Controls: Whether its buttons or a touch-sensitive screen, make sure that they all work properly and will not depreciate over time. Media files and storage devices: The more of these your DVD player can support, the better. Some players are notorious for not being able to support certain storage devices as advertised. Durability: Working well on the first or second day is not enough. Refer the reviews of previous users to find out if your player can perform consistently over a long period of time. Price: Finally, make sure that you are getting the best value for money. Prices vary a lot with portable DVD players and many can be deemed unreasonably expensive. Why we like it: A remarkably good portable DVD player by anyone’s standards that is as functional inside the car as it is outside of it. DBPOWER has been around for around half a decade now and in that time, you might tend to learn a thing or two about the tech industry. 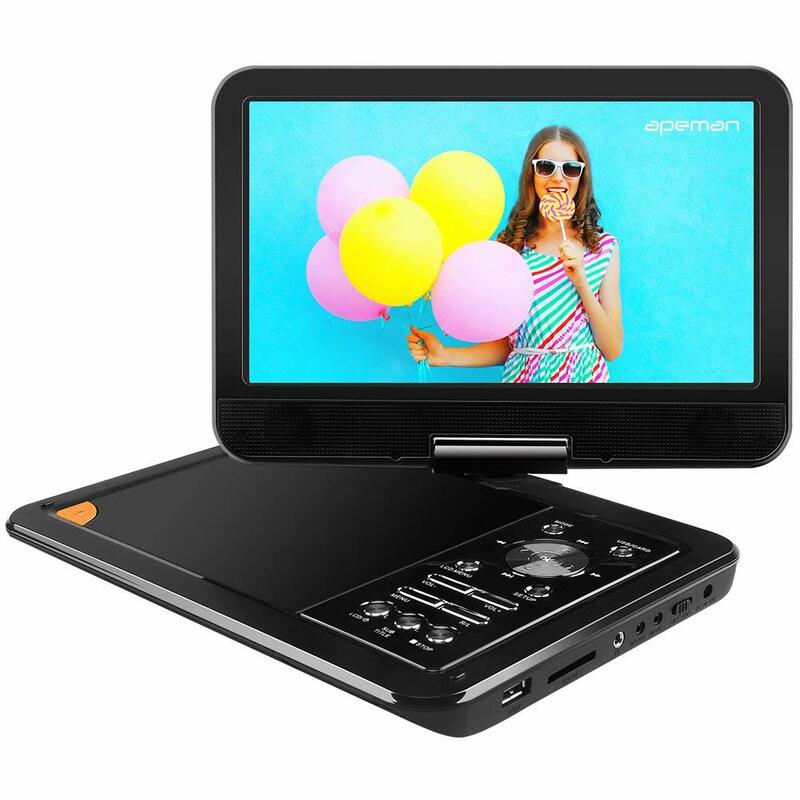 Thanks to several key improvements and solid testing, this 9.5-inch portable DVD player is an absolute delight to feature in your car. In keeping with modern times, DBPOWER has promptly given this DVD player an SD card slot and USB port. There is a slot for a multitude of disc formats as well including CD, CD-R, DVD, DVD+R, DVD+RW, VCD, SVCD-R. Unfortunately, the player does not support Blu-ray DVDs. Supported video file formats include AVI, MPEG 1, MPEG 2, MPEG 4, VOB, and XVID. Compatible audio file formats are MP3 and WMA and image file formats are JPEG only. More often than not, you may find yourself having to stop watching a program halfway to attend a more urgent matter. That is why this DVD player is equipped with a ‘last memory function.’ When turned on, it will pick up the show from where you left off for a more efficient viewing experience. While we have listed this DVD player mainly for reasons that it can be enjoyed when inside your car, it is worth mentioning that you can carry it around with you anywhere you want. It can also be connected to your television. As portable DVD players go, this one is right up there, thanks to its impressive functionality and versatile usability. At least, it will keep the kids entertained during long drives. 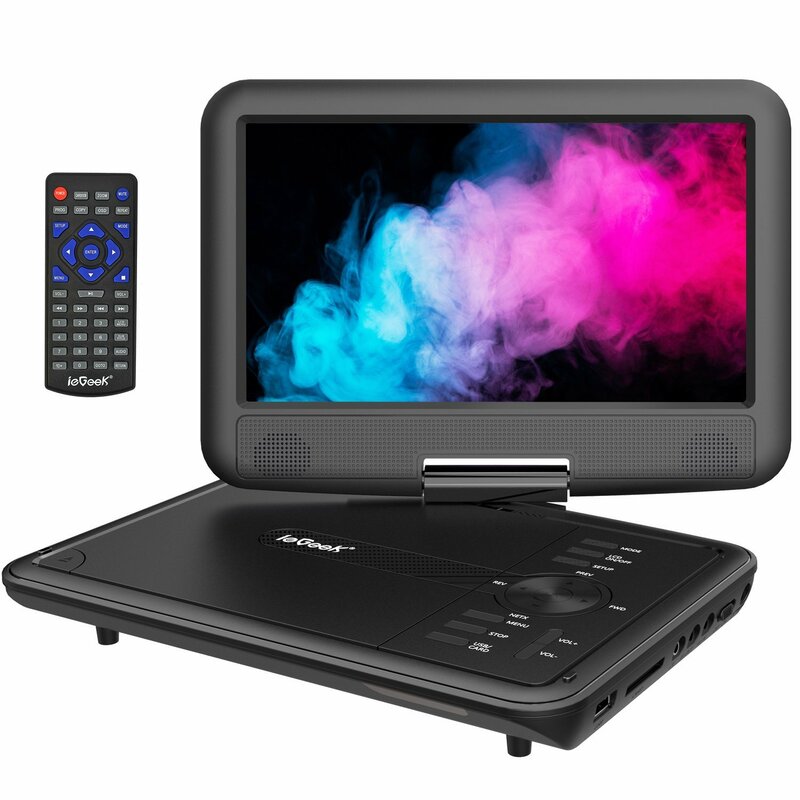 Why we like it: With this 10.5-inch portable DVD player, DBPOWER have done everything in the book to make it as user-friendly and long-lasting as possible. 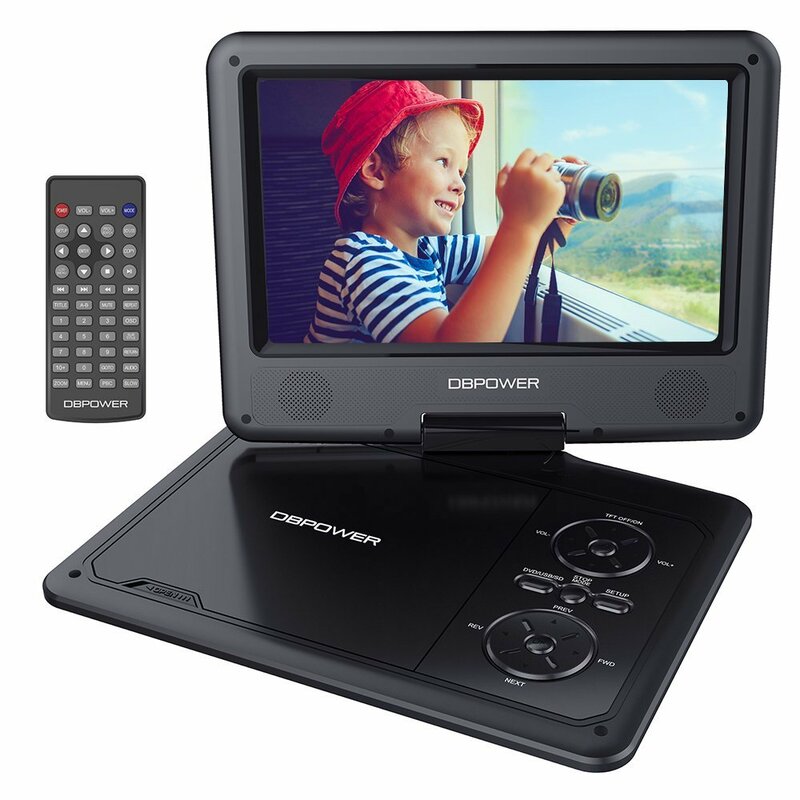 Once again from DBPOWER, this time, the 10.5 inch portable DVD player with a rechargeable battery system and the essential slots for SD cards and USBs. There will be no wiring involved with this player as it can go on entertaining you for up to 4 hours. That is enough to cover an entire ‘Lord Of The Rings’ movie and then some. Selling at a rate of almost 1 from every 3 portable DVD players on Amazon, DBPOWER is fast becoming a name that needs no introduction in the tech industry. DBPOWER maintains its place at the forefront of the market by constantly upgrading the firmware and conducting strict tests to ensure high-quality viewing. Playtime has gone up to 4 hours which means continuous entertainment and you will not be fumbling about with any charging cables even on decently long drives. The player features a USB port as well as an SD card reader so it can lay as many mp3 and mp4 files as possible. It has not completely outgrown disc formats either. You can insert everything from CDs to DVDs, DVD+R(-R)s, DVD+RW(-RW)s, VCDs, SVCDs, and CD-R (RW)s. It supports all major video, audio, and image file formats. What’s more, it can even pick up a film from where you left off thanks to its break point memory function. With the ability to support all major storage devices and file formats as well as an extraordinarily long playtime, it is little wonder that this DVD player gets a spot on our top 10 list. Why we like it: A portable DVD player that has been well-configured to entertain a wide range of viewers, even the little ones, for several hours on a single charge. Roald Dahl may have strongly cautioned parents all over the world not to allow them anywhere a television set but that certainly has not stopped the market from playing the occasional cheeky hand. 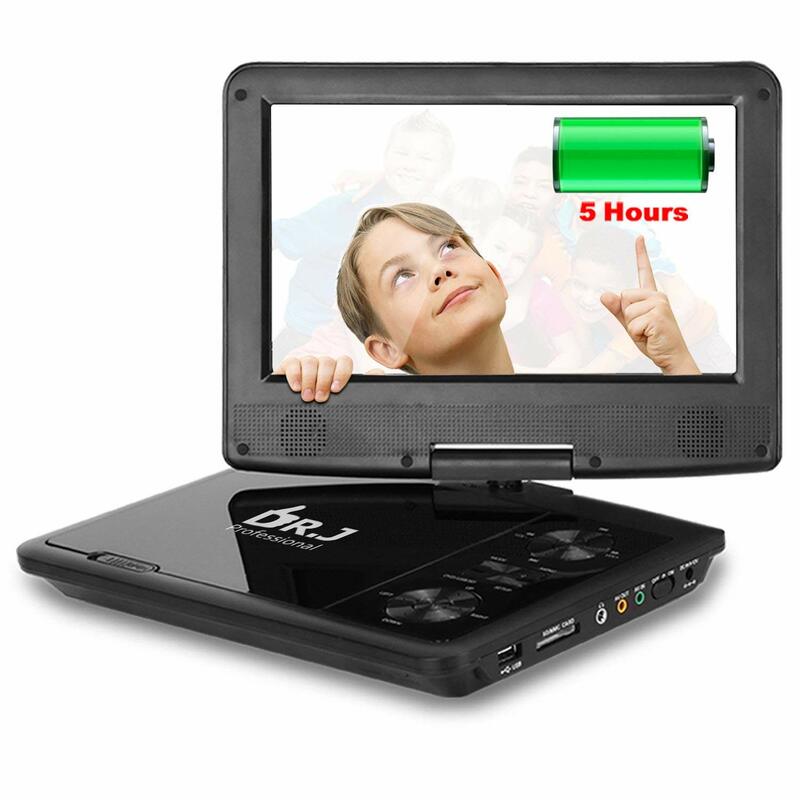 ieGeek pitched its 11.5” portable DVD player as an excellent birthday present for your precious minor. After all, it is not the television set itself that is the main agent of brain rot so much as the type of programs that are viewed on it. But here in our review, we all about the technicalities and on that front, ieGeek does not disappoint. But even here, the men in coats have confirmed that prolonged exposure to a digital screen can cause vision problems to a child’s eyes. Hence, this DVD player has been fitted with the latest LCD eye protection screen which extensively prevents dazzle and flickering. Like many other top of the range models, this DVD player has a last memory function which allows you to pick up an incomplete program from where you left off. It also has a repeat function so it can automatically play the same material like a song over and over again. It is certainly a feature that a lot of the younger kids will appreciate. You can also copy the files from a CD onto another storage device like a USB drive or SD card. Lastly, if the 11.5” screen is not enough, an AV output allows you to connect this player to your flat screen TV for a better viewing experience. But while in the car, its running time of 5 hours should keep the kids entertained for most long distance drives. The battery, of course, is rechargeable. Why we like it: A simple and well-made DVD player from UEME that is just as entertaining inside your car as it is outside it. 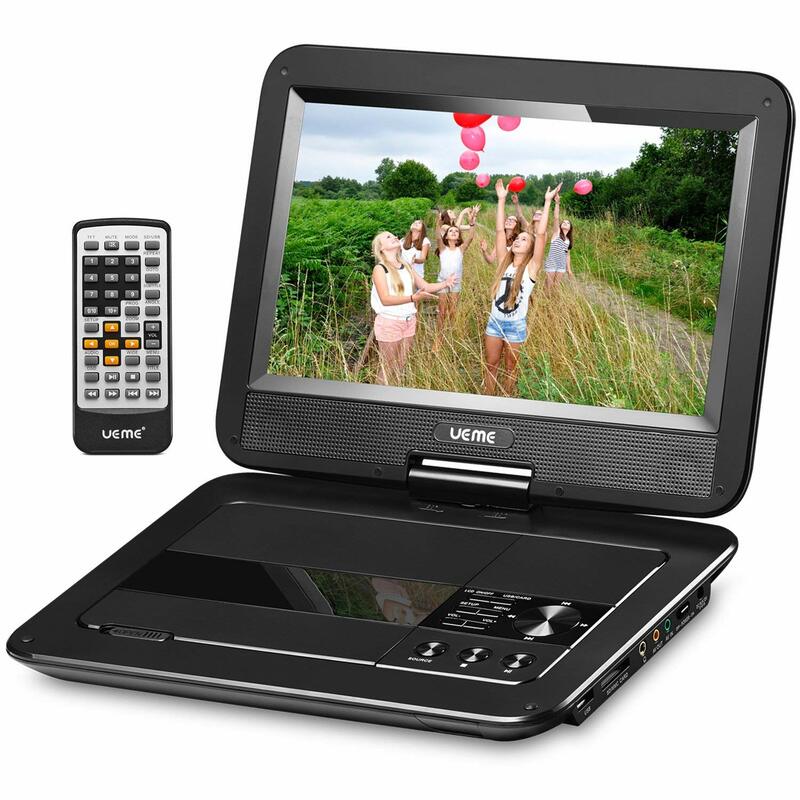 The UEME 10.1” portable DVD player runs on a rechargeable lithium battery that can last up to 4 hours on a single charge. That makes it a very competent entertainment system for long drives in the countryside. However, it would help to set it up in a relatively quiet car since those 4 hours will shrink a little if you have to turn the volume up. Fortunately, there is a 3.5mm headphone jack to keep you zoned in even when the outside world is a bit too noisy. However, this DVD player is equally impressive outside a car as it is inside. AV OUT ports allow you to connect the DVD player to your main TV so you can view the same media on a larger screen. And speaking of screen size, the UEME’s 10.1” with a TFT color LCD display 16:9 widescreen is about as good as it gets for a small, portable entertainment device. The screen can be rotated as well either to 90 or 180 degrees and has a resolution of 1024×600. This DVD player supports all major disc formats. Supported video formats include vob, avi, xvid, flv, mpeg1, mpeg2, and mpeg4. For audio formats, you only have a choice of MP3 or WMA and with image file formats, JPEG and BMP. You can input your entertainment files via a USB drive or SD card. Why we like it: With a running time longer than most and the ridiculous viewing angles it can be set up in, you know this one was made to be your long-distance travel entertainment system. Going on a road trip can be absolutely delightful. But in the case of most families, there is always that important something that managed to evade your luggage while you were packing it. A power adapter, for instance. But it is ok THZY 9.5 inch portable DVD is powered by a 3000MaH battery that will sustain it for a good 5 hours. So that is two full movies to enjoy during the journey and perhaps a few Looney Tunes after that. And if you do remember to bring your power adapter along, you will find that its length at 1.8 meters makes the player that much more convenient to use and set up. More on convenience, this DVD player has a breakpoint function that allows you to pick half watched programs from where you left off. This player can support many disc formats including CD, DVD, DVD+R(-R),DVD+RW(-RW),VCD,SVCD-R(RW), and CD-R(RW). Supported video file formats include VOB, AVI, MPEG 1, MPEG 2, and XVID, and the only supported image file format is JPEG. 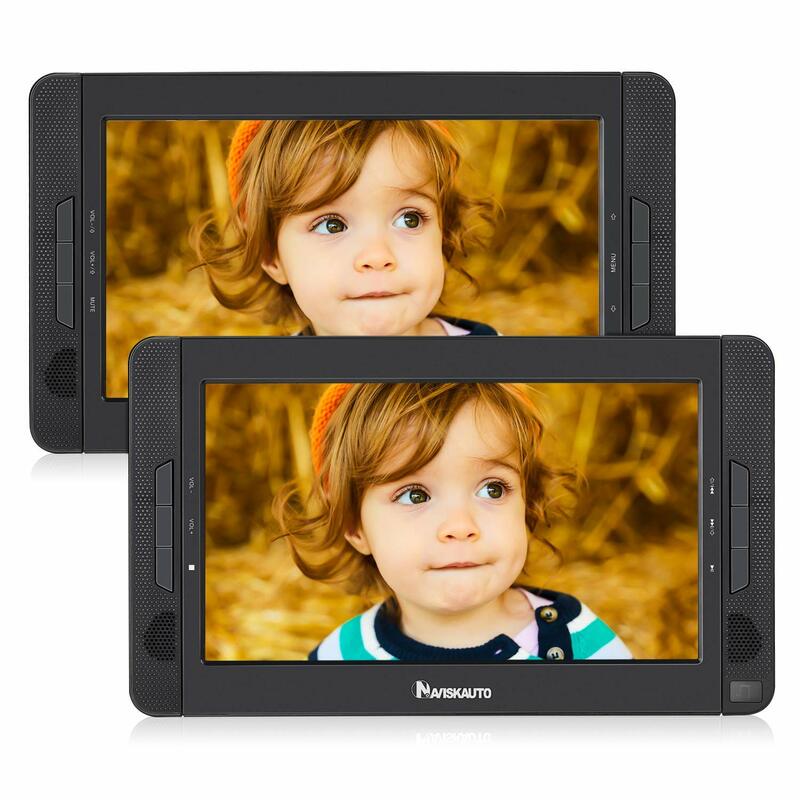 The 9.5 inch LCD screen has been configured to be as safe as possible to the eyes even for children. Everything included in the package is simple and functional. There is the portable DVD player, AV cable, power adapter, car charger, remote controller, and user manual. It is all remarkably easy to use. It even has a car headrest mount holder which allows the screen to be rotated and flipped in ridiculous angles all for your viewing pleasure. 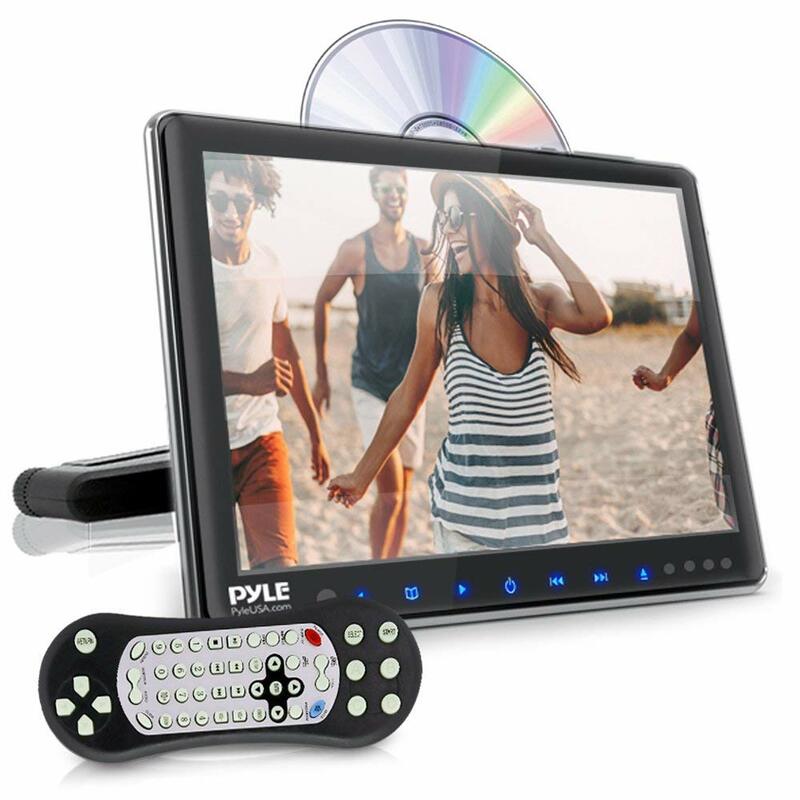 The Pyle PLHRDVD904 (whatever that means) may have a screen slightly smaller than most but that is only to make this multimedia player system a comfortable fit to the headrest of your car. But rest assured it has all of the other assets you would expect to find in a high-quality portable DVD player. Its high-resolution LCD widescreen has a top loading CD DVD player to keep your passengers fully entertained during the journey. But it is not just discs that can be used. Thanks to a built-in HDMI port and AV connector, you can also connect your smart devices like your smartphone, tablet etc. A variety of digital formats like MP3, MP4, AVI, and WMA are accepted with slots for both USB drives and SD cards. This system also features an integrated IR transmitter as well as an RCA wiring harness which allows you to play movies, music and video games in total seclusion. The title says this is a universal car headrest monitor and there is a very good reason for that. 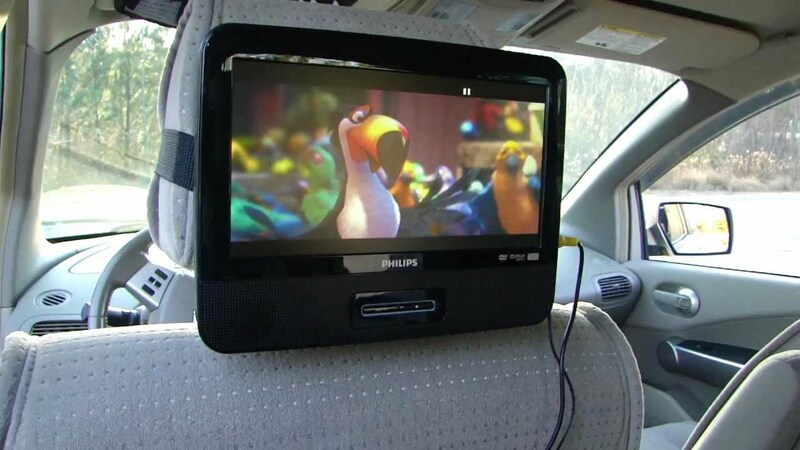 Being a portable DVD player it has been configured to fit comfortably into the headrest post of any modern car. And it comes with its own removable leather screen cover as well as remote control and mounting bracket. Impressive much. Why we like it: Simply equipped yet vastly capable with an unplugged running time of 4 hours, the WONNIE is as good a product as any to be featured on our list. 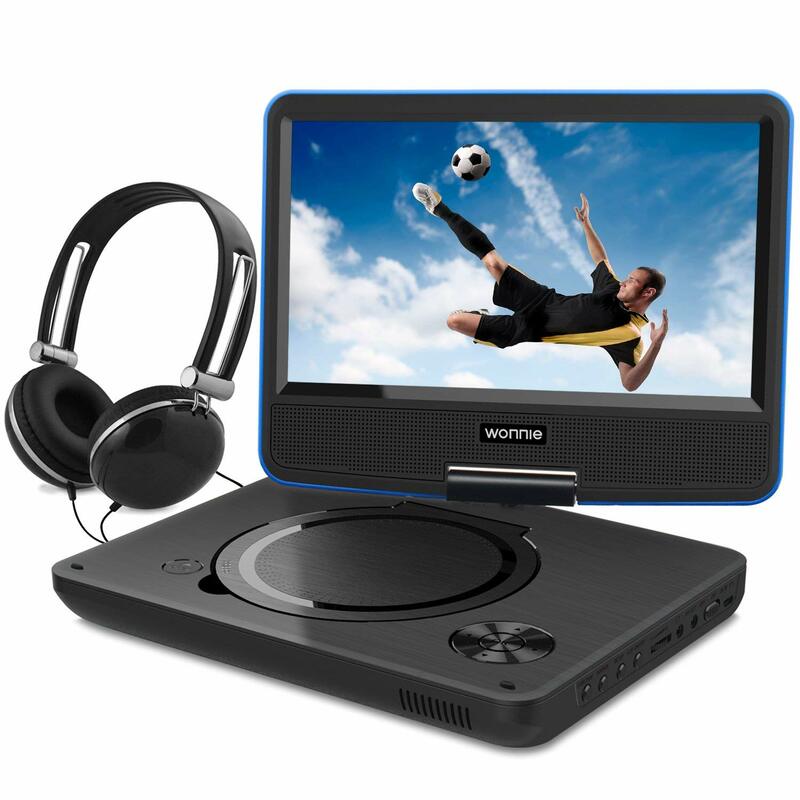 WONNIE has launched an updated version of their portable DVD player and here it is, lighter than it used to be and containing 4 hours of swiveling, digital fun in a single charge. Other updates include an integrated virtual remote that makes all the functions accessible to you in case you forgot to pack the remote controller for your long drive. What’s more, with most other portable DVD players, you would have to take into account how long they will run on a single charge; not so with this one because it comes with a 5-foot long car cord, long enough to for you to keep it plugged in while using it. And even you were particular about unplugged running times, the WONNIE can last up to 4 hours on a single charge, not the highest on our list but still very much in top 10 territory. Then there is the screen. It is quite maneuverable, able to rotate to 180 or even 270 degrees so that you can achieve the perfect viewing angle. When it comes to supported media file formats, the WONNIE is very much in league with the rest of its high-end competitors. It supports disc formats ranging from CD to DVD, DVD+R(-R), DVD+RW(-RW), VCD, SVCD-R(RW), and CD-R(RW), video file formats like VOB, AVI, MPEG 1, MPEG 2, and XVID, audio file formats, MP3 and WMA. The only supported image file format is JPEG. Included in the package are the portable DVD player, a stereo, earphones, an AV cable, car charger, remote controller, power adapter, backpack, and the user manual. Why we like it: Designed to entertain long and well without drawing your hands away from the wheel. We all know the golden rule of driving is to keep your hands on the steering wheel at all times. In that regard having a portable DVD player to play with can appear to be counterproductive. Fortunately, the people behind the Apeman PV760 take driver safety rather seriously and have configured their product to be mounted on the car’s headrest. So no fiddling with your hands will be necessary while you are at the wheel. But of course, the good news does not end there. As a customer, you will be keen to know how long it can last on a single charge. We are pleased to report that can run for up to 5 hours before needing a plugin, and because it comes with a specialized car charger, you can charge it without fumbling around with any cables or wiring. Then we come to the screen. It is a swivel screen so it is highly maneuverable, able to rotate 270 degrees and fold back a full 180 degrees. Slots for USBs and SD cards are a given. Supported media file formats include DVD, CD- R/RW, DVD -R/+R, DVD+RW/-RW, VCD, SVCD, MP3/WMA/WAV, JPEG/BMP, MPEG2/MP4/AVI/DIVX, TXT, and NES (game format). Everything about this device proves it will be a great addition to your car’s entertainment system. However, it can be just as great to use when you are not on the move. A 3 in 1 cable included in the package allows you to connect it to your TV or projector for a better viewing experience. And yes, you do get an AC wall charger to go with that. 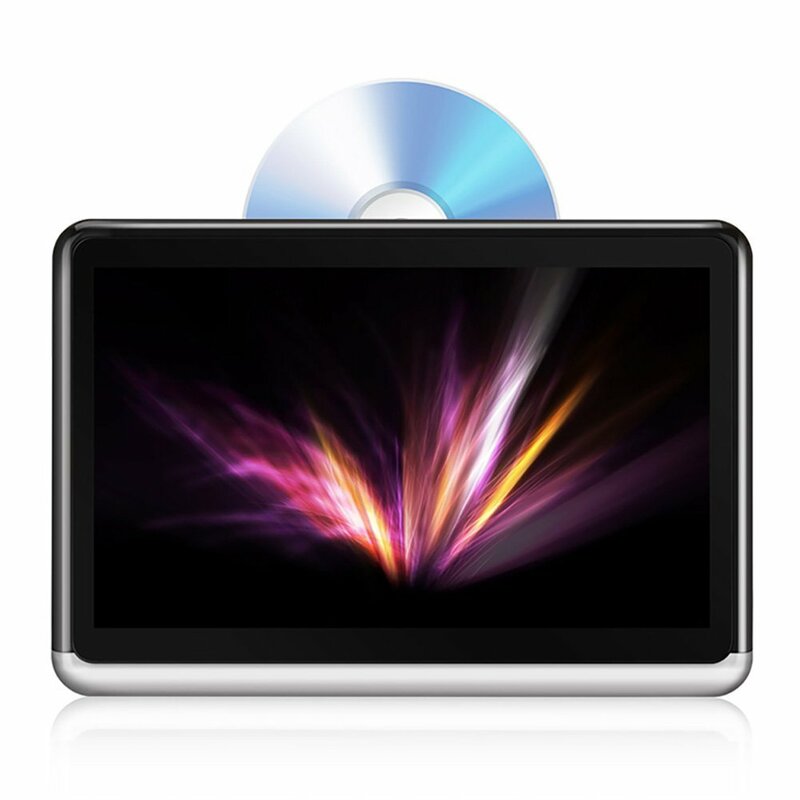 Why we like it: Portable DVD player or tablet? Most people would hesitate to say at first glance. Many portable DVD players have defined progress as everything to do with technicalities such as screen resolution, fast charging, longer running times, and general usability. However, the DDAUTO has taken a slightly different turn by incorporating android technology, specifically an Android 6.0 superior quad core ARM A7 quad 1.3Ghz CPU. Pardon us having to spell out that long and uninteresting name but the point is this DVD player has internet connectivity and the ability to support various apps. So in a way, it renders the typical competition totally obsolete. That said, however, it will still fit in most disc formats. A built-in 4000mAh battery allows for unlimited usage with no wiring involved. It will fit nicely on the headrests of most cars without straining your eyes and neck too much. But because it is portable, you can set it up in virtually any position you want to suit your preferred angle of viewing. The screen on this is highly impressive. It is a 10.1 inch IPS display 768 pixel LCD touch screen with a slot in type of lens. Being a hybrid mix or portable DVD player and android tablet, the DDAUTO is uniquely capable. It is probably one of the few small scale electronic devices that has a disc tray and internet connectivity in the same package. Also, in the true spirit of the 21st century, it is very simply equipped. You will get yours with just the player, cig charger, adjustable mount, and 5 holder pipes. Why we like it: You could say this goes the extra mile to be entertaining for the whole family and in quite a few areas. The NAVISKAUTO may belong to the class of portable DVD player, but the truth is it is more portable than most. Why? First off, it can run for up to 5 hours between charges and when the charge does finally run out, you have a grand total three different charging mechanisms for it. First is a built-in rechargeable 2700mAh lithium battery, an AC power adapter for when you are at home, and car charger for when you on the move. But there’s more, this DVD player is actually dual-screened. The main monitor is used for AV output while other is used for AV input. This player will also support more storage devices than usual, accommodating USBs, SD cards, and MMCs and play your downloaded media on both screens. When it comes to media file formats, this player supports almost all the major types that people use be it discs, audio, or images. You can be entertained by this screen while holding it yourself or you could fasten it on to the headrest of your car using some simple Velcro straps. And even if you have to abandon your film halfway, you can always return to the point where you left off thanks to the last memory function. The equipment of the NAVISKAUTO is deceptively simple, just that the two screens and charging mechanisms can make it look a bit in excess. But overall, this is a remarkably capable product. With portable DVD players as with any other device, you cannot just walk into a store and grab at the first one you see. There are a few things to look at, more than a few if we are being completely honest. Each driver will have varying interests in how they want their DVD player to perform. Before thinking about what your personal preferences are with portable DVD players, there are some general criteria to look at. That is precisely what we are about to go into now. So what are the key features that should be present in any portable DVD player that is worth buying? All portable DVD players are small enough to be carried around. However, size is not everything. Other factors such as packaging, amount of components and charging mechanisms also help determine just how usable your DVD player is outside the home. Often times, you look up portable DVD players online and notice that the screen size is almost always included in the main title. In some, it has become attached to the name itself, and there is a very good reason for this. Just like with smartphones, people shopping for portable DVD players will look to get as big a screen as they can. It is not as though smaller screens are particularly bad but a larger screen just provides less of a strain on the eyes since things are easier to focus on when they are magnified. The tradeoff is that larger screens tend to be bulkier and heavier so at the end of the day, choosing the right balance it what it is all about. This is another common feature that is sought after in any small entertainment device. The controls should be precise and user-friendly. The lesser buttons there are to control all of the key functions, the easier it is to use them. As a driver, this is a feature you are going to appreciate very much. It will also give the device a cleaner, aesthetically pleasing profile, something that can often go underrated in a customer’s evaluation process. You may not want to admit it as it seems like a minor detail but looks matter. While discs are fading fast into irrelevant, we reckon that as long we have portable DVD players around, they had might as well be able to play a few. The best portable DVD players can support any commonly used disc format as well as others USB drives and SD cards. Variety also matters when it comes to media file formats. Current portable DVD players have rather impressive run times. They can last up to 4 or even 5 hours between charges. If you are that driver that undertakes long drives on a regular basis, this ought to factor in pretty strongly when making your decision, especially if you have a couple of kids you want to keep still and entertained in the back. You also want to make sure that when the juice runs out, you will not be left stranded for a charging device. It is best to go for a player that can be charged inside your car as well outside, even better if it comes with a rechargeable battery. This is a universal feature to look for in anything that costs money and with portable DVD players, it is no different. There is a lot of price mobility with portable DVD players so be sure to review as many as you can before making your purchase. Finally, however much it may cost, no one will be amused to find that their DVD player cannot last more than a few months with developing a few glitches. Try and find as many reviews as you can of the product you are considering buying so you know how well it can perform several months down the road.